Monday morning pre-market saw Nasdaq Futures locked at limit down. The Dow Jones Industrial Average moved in a 3,000 point range during the first 90 seconds of trade on Monday morning. Thursday through Monday marked the worst 3-day decline in Dow Jones history. Monday marked the third consecutive 95% down volume day for S&P 500 components. This has never occurred before, not even during the 2008 sell off. At the moment the daily charts of the market indexes look very similar to the 2010 flash crash when the market inexplicably collapsed only to snap back in a matter of a few days. 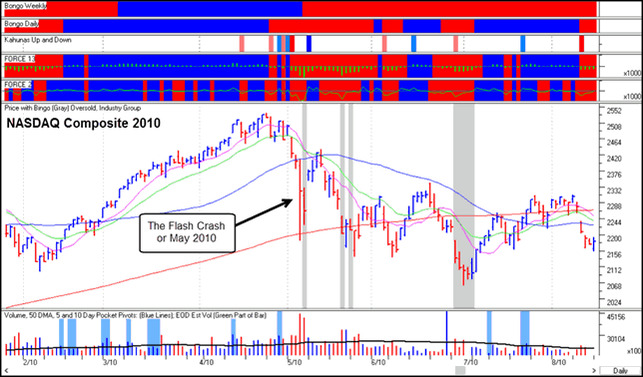 In 2010 the snap back was short lived as the market indexes re-tested the flash crash lows two weeks later and then chopped back and forth for weeks. It would seem to me if today's market is to follow the 2010 market template, then the selling should resume very early next week. Despite the robust selling at the beginning of the week, one can not discount the fact the major indexes showed weekly gains by Friday's close. The Nasdaq-100 (weekly chart) with a +3.14% weekly gain, the Nasdaq (weekly chart) with a +2.60% weekly gain, the S&P 500 (weekly chart) with a +0.91% weekly gain, and the Russell 2000 (weekly chart) with a +0.51% weekly gain. It appears the new found strength in the market indexes at the end of the week was due to the Q2 gross domestic product report which showed the U.S. economy expanded at a 3.7% seasonally adjusted annual rate in the spring, faster than the initial estimate of a 2.3% growth rate (article). However, gross domestic income advanced at a much slower 0.6% pace last quarter (article). Regardless of whether GDP or GDI more accurately reflects U.S. economic activity, stock market participants were more than a little nervous at the beginning of the week as witnessed by the high volume of selling. It is too early to determine if the rapid snap back was due to short covering or a true buying interest by investors and traders afraid of missing the next upward move. Perhaps the monthly charts provide more clarity and perspective of the "big picture" as to what has been occurring in the stock market. The monthly charts show a stock market that has been under distribution since mid July. Currently it is anyone's guess as to how the market behaves in the coming weeks as the battle plays out between greed and fear. As always I remain mindful that anything can happen from one day to the next. ©2014-2016 Derek Bertauche. Simple theme. Powered by Blogger.